With every car manufacturer around the globe offering at least several models to choose from, finding the SUV that perfectly fits your passenger and cargo hauling needs can take countless hours of research. With one more row of seats than a fullsize car and more power and control than a minivan (thanks to AWD or 4WD), 7 passenger SUVs strike the perfect balance between these other options for families, which explains why they’ve become so popular in recent years. To assist with your search, we’ve done the research for you and narrowed down the list to the 10 best SUVs that seat 7 or more passengers. Since 2003, the Honda Pilot has been known for its extreme versatility and practical functionality. This trend continues for the 2016 model year, where this successful formula continues to be used to great effect. 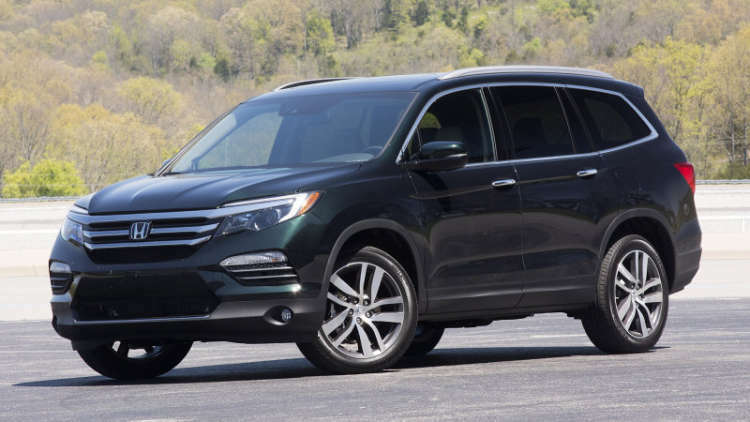 The 2016 Pilot is both comfortable and spacious with plenty of room for cargo and passengers. A third-row is included for seating up to eight, or it will seat seven with the optional captain’s chairs in the middle row. The third-row itself is actually usable by adults, a nice change from the generally cramped and uncomfortable third-row option most manufacturer’s place in their vehicles. The interior has a high-quality feel to it, and no part of the 2016 Pilot seems cheap or flimsy. It’s powered by a 280 horsepower V6 that is rated by the EPA to get an estimated combined 23 mpg. It’s also an IIHS top safety pick+. Driving in the 2016 Pilot is both quiet and comfortable; the Pilot feels controlled and maneuverable despite its large size, and there’s plenty of acceleration thanks to its strong V6 motor. The 2016 Honda Pilot isn’t just one of the best vehicles in it’s class, it’s one of the best vehicles on the road today. A great looking vehicle at an affordable price, the 2016 Nissan Rogue is a solid entry in the compact crossover SUV class. The 2016 Rogue looks great on the outside, with smart styling and a compact form, while on the inside it’s well-equipped and comfortable. It will seat up to seven, though as expected the third-row lacks the space to be a real option for longer trips. Aside from that minor issue the Rogue is comfortable and packed with a number of standard features, including rear-view camera, and a generous offering of smartly priced extras. 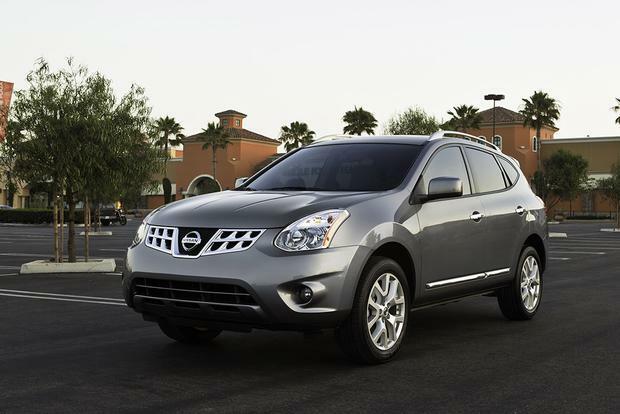 A 170 horsepower 2.5L inline-4 gives the Rogue lackluster acceleration, but it’s still suitable for everyday driving. Fortunately the ride is extremely comfortable to make up for this, and the Rogue shines as a daily commuter as a result. The most obvious advantage to the Rogue’s smaller and less powerful engine is in its fuel efficiency, where the Rogue provides a fantastic 28 combined mpg. While the Rogue may not be looking to shatter the status quo for compact SUVs, it is an exceptionally great value and many buyers will find it fits their needs nicely. Combining an affordable price with V6 power and SUV versatility is often a successful formula for auto-makers, and one Hyundai has played on wonderfully with the 2016 Santa Fe. While its 290 horsepower 3.3L V6 isn’t going to win any awards for fuel efficiency, it still provides a respectable combined 20 mpg. The Santa Fe does come with a third-row for seating up to seven, but as with most crossovers the third row is best reserved for young children. The other seats are comfortable to make up for this, however, and the Santa Fe will easily transport four adults on long trips. Overall quality on the inside of the vehicle is marginal at best, though that’s not unexpected for the low cost, nor is the vehicle’s sparse standard equipment. This is meant to be an economy commuter in every sense of the word. 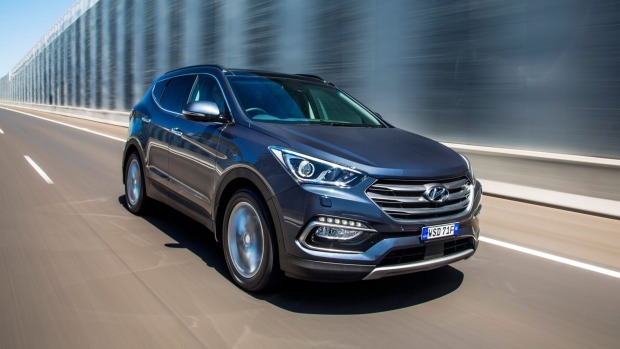 Fortunately it does very well in that role, and consumers looking for an affordable entry in the compact crossover class will find a lot to like in the Santa Fe, particularly if they decide to spring for Hyundai’s various available extras. Toyota has become a byword when it comes to long-term reliability and low cost of ownership. 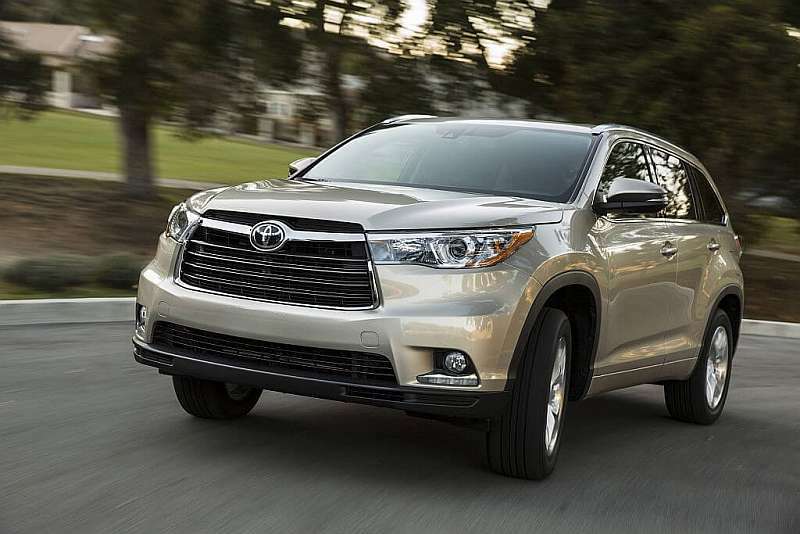 Its vehicles are practical and well-built, and the 2016 Highlander is no exception. Toyota has chosen to place its focus on function and versatility in the Highlander, and as a result they’ve created a vehicle that seems dull at first but quickly shows just how well this decision can pay off. The Highlander stands out as one of the few third-row seating crossovers with a usable third-row, and the spacious interior has plenty of cargo room. The 2.6L 4-cylinder engine won’t break any speed records, but it does give the Highlander plenty of power and even some admirable towing ability as well as a combined 22 mpg Driving in the Highlander is quiet and comfortable for both driver and passengers alike, and the fact that it’s an IIHS top safety pick+ doesn’t hurt the Highlander’s chances with family shoppers either. The Highlander fits comfortably in between it’s more rugged brother, the 4Runner, and it’s smaller cousin the RAV4, filling the much needed role of a family commuter in Toyota’s lineup. Audi’s largest SUV, the Q7, has undergone some radical structural upgrades for the 2017 model year that significantly improve the vehicle in almost every way. Already a serious competitor in the SUV class and one of the few third-row seat vehicles capable of delivering an enjoyable driving experience, the redesign of the Q7’s bones has only made it stand out even more among its competitors. 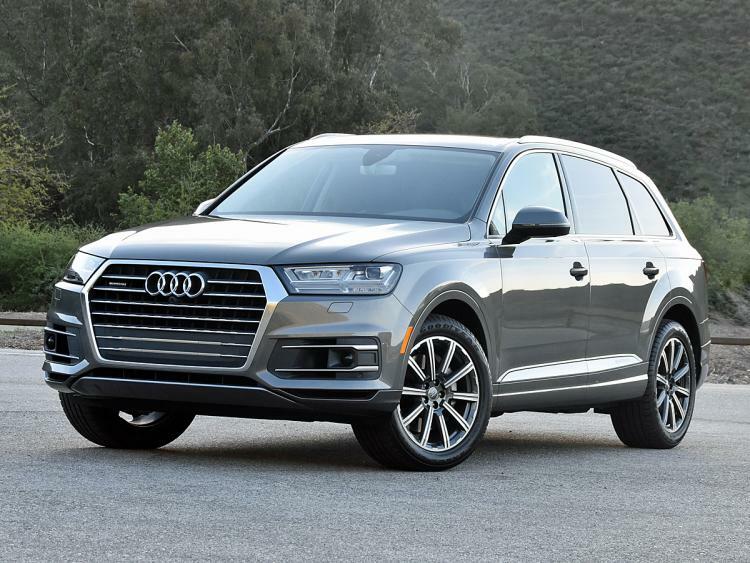 The 333 horsepower supercharged V6 helps the Q7 leap forward from a dead start, and its sophisticated suspension and lightweight design allow it to corner almost as well as some of Audi’s coupes. On the inside it’s loaded with technology and wrapped in luxury, with plenty of space and comfortable seating for the front and middle rows, though the third-row is still best reserved for small children or very short trips. The Q7 is another IIHS top safety pick+, offering one of the best front-crash prevention system in its class and an array of driver monitoring safety features intended to reduce the chance of an accident. A truly great Luxury SUV cleverly hidden under a thrilling driving machine, the 2017 Q7 is poised to be a top-contender in its class. A direct competitor to the above listed Q7, the 2016 Acura MDX is faster, more spacious and safer than its previous model year. A new 9-speed automatic transmission coupled with a 290 horsepower 3.5L V6 that’s rated at an EPA estimated combined 23 mpg. Like the Q7, the MDX is meant to be a driving machine, and while it doesn’t quite hold pace with the Audi’s supercharged V6, it’s still a thrill to drive, corners well and has an exceptionally smooth ride quality. Inside the MDX is well-built and well-equipped, and with all the available extras offered by Acura it’s easy to fully-equip the MDX as well as any luxury manufacturers high-end offerings. The standard third-row seating isn’t terrible for a crossover, but most adults will need to be seated in the second-row, which is comfortable and well-suited for long trips. 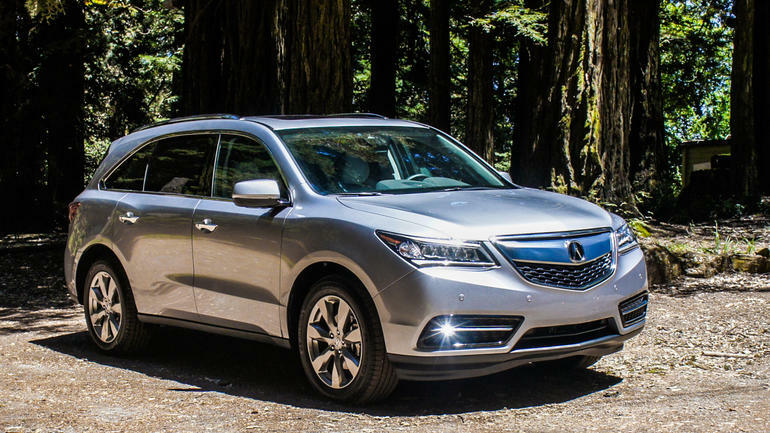 This year the MDX is an IIHS top safety pick+, and it might just be one of the safest SUVs on the road today when equipped with a long list of available safety features. Aiming squarely for the top spot in the Luxury Crossover class, Acura has built a true contender for that title and is worth more than a passing glance by any buyer looking to buy a vehicle in that class. Kia has started to become known as a reliable alternative to the more expensive vehicles offered by Honda and Toyota, a reputation they’ve worked hard to promote and maintain. 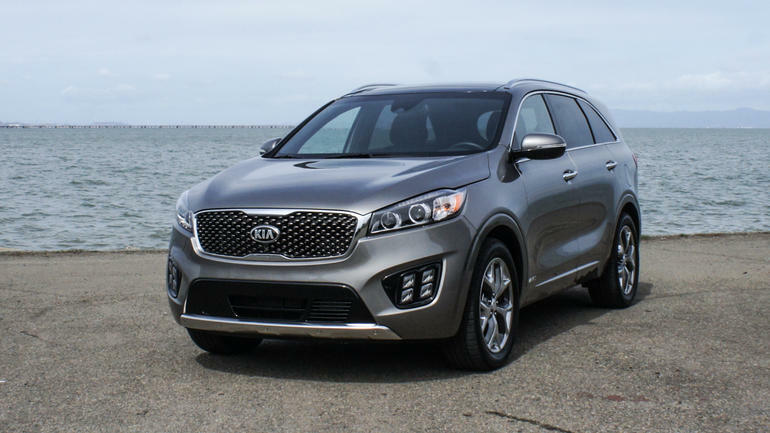 The 2016 Sorento is a showcase of this, providing function and form in an inexpensive package, with third-row seating to boot. Unfortunately the Sorento’s second and third-rows are mediocre at best, but there’s still a lot to get excited about in the Sorento. A spacious, well-designed interior has increased space over previous years, and for such a small crossover there’s a lot of room to pack in people and cargo. The Sorento’s peppy 2.4L 4-cylinder engine produces 185 horsepower and feels more than adequate for the vehicles light frame. It’s rated by the EPA at an estimated combined 24 mpg, and is also an IIHS top safety pick. Even better, the Sorento performs admirably in all-weather conditions, with significant ground clearance and actual off-road options like a locking differential. Kia has managed to pack a lot of punching power into this small crossover, and there’s a lot here to entice buyers interested in a compact crossover SUV. The Dodge Durango has been around for many years, and it’s gone through a significant evolution since its inception. While the old truck-like underpinnings have gone away and been replaced by a much more modern look and feel, the Durango hasn’t forgotten it’s roots. There’s plenty of cargo space in the Durango and its third-row is one of the better seven seat options available in an SUV. Dodge offers a mighty Hemi V8 for those interested in extra hauling and towing power, or a standard V6 equipped with Dodge’s Fuel Saver Technology that will deactivate cylinders at cruising speeds. The Durango’s rugged utility comes at the cost of fuel efficiency, where the Durango limps in at a passable combined 21 mpg. The interior is about on par with other Dodge vehicles; functional and comfortable but without much in the way of extra flair except in the higher-end R/T trims. It’s also loaded with standard safety features, including a number of airbags in all locations and optional blind-spot monitoring. From the outside the Durango looks great, having undergone additional styling tweaks to its ever-changing exterior. 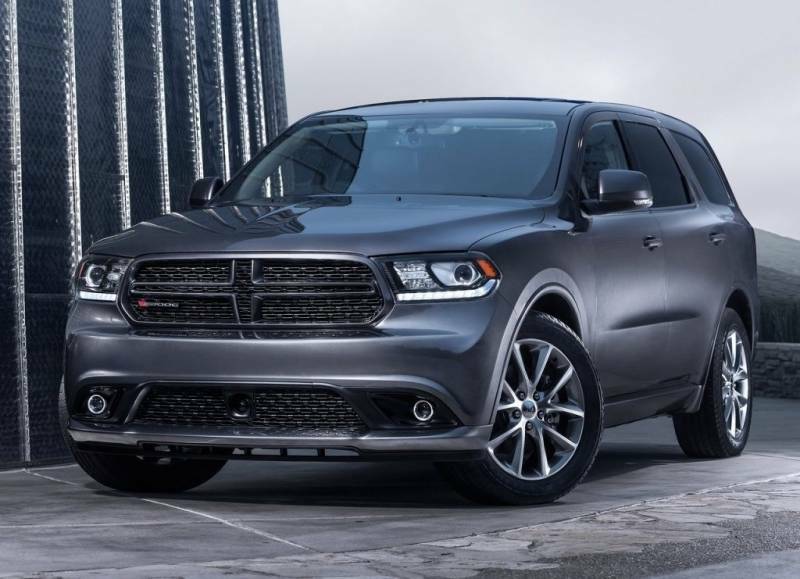 Dodge continues to improve upon a successful formula with the 2016 Durango, providing a strong workhorse crossover at an affordable price. BMW ads claim that the manufacturer creates “The Ultimate Driving Machine”. With an SUV this can become a questionable endeavor at best, or an outright disaster at worst. 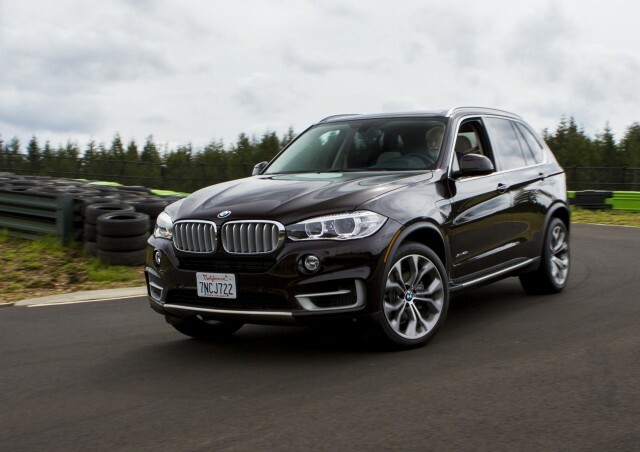 Fortunately the engineers at BMW are well-versed in their craft, and over the years the X5 has gone from a boxy attempt at a performance SUV to a sleek, well-tuned crossover that could give most sports-coupes a run for their money. While BMW offers a wide-range of interesting and expensive trims, the base model is equipped with a 300 horsepower twin-turbocharged 6-cylinder gasoline engine that will take the X5 from 0-60 in just over six seconds. Its impressive power is offset by an EPA estimated combined 21 mpg, but considering what it’s capable of the fuel efficiency could be much worse. If that’s not impressive enough, the spacious X5 has third-row seating available, though like most crossovers it’s going to lack the proper amount of space for adults. The rest of the interior is immaculately comfortable and well-designed, and the ride is perfect for both drivers and their passengers. If there’s one downside to the X5 it would be the cost, which can rapidly reach close to and even over the $100,000 mark when higher-end trims, lots of optional extras, or the blistering M model are selected. That’s not likely to phase most buyers looking at the 2016 X5, however, as it sits comfortably near the top of the crossover SUV pack. 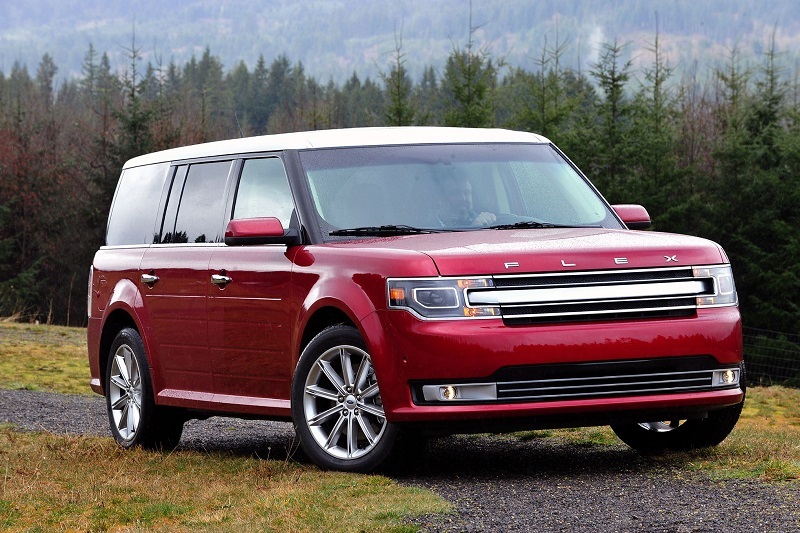 The Ford Flex is a unique entry in the mid-size SUV market. Ford isn’t concerned with following the trends or paying attention to what other manufacturers are doing with their vehicles; they know that if they offer a versatile and spacious SUV that drives well the customers will come to their own conclusions regarding what’s “good”. As a result, the 2016 Ford Flex is one of the best vehicles in it’s class, providing more interior space, more utility and a better driving experience than its trendy competitors, and at an incredibly attractive price. The 2016 Flex features one of the few usable third-row seats in its class for seating up to seven, and more cargo room than almost any other vehicle of its size. The interior is surprisingly well-made, with almost no “cheap” feel in any of its parts. Its base model 3.5L V6 produces 287 horsepower and is more than enough to give the Flex plenty of zip. The Flex also handles like a dream, with quick, responsive steering and exceptional cornering ability to add to its power and utility. The only noticeable downside for this shockingly cheap mid-size SUV may be its fuel efficiency, which comes in at an EPA estimated combined 19 mpg. That’s still not terrible when what the Flex is capable of is taken into consideration, as it can easily compete with much larger and thirstier full-size SUVs for size and passenger space. All this combines to create what may just be the best mid-size SUV available on the market today.